The Griever uses spikes to climb the wall and shines a blinding red light straight at Thomas. Knowing he can’t stay where he is, Thomas moves sideways across the wall by using his body weight to swing and catch nearby vines. The Griever follows Thomas instead of going for Alby, which makes Thomas feel glad that he can draw the creature away from the unconscious and vulnerable Alby. Thomas’ sense of responsibility, a hallmark of maturity, shows that he is becoming an adult. Thomas accidently swings into a wall and loses his grip. As he tumbles down the wall, he manages to catch a vine halfway before hitting the floor. Thomas pushes off the wall and swings backwards, hitting the Griever’s slimy body. As he swings off, he feels the creature’s claw make a gash in his back. Thomas’ steadfast determination and sense of hope give him the courage to attack the Griever head on. Unlike the timid Gladers who stick to the rules, Thomas, with hope on his side, tries a new method for survival: fighting off the Grievers. Thomas lets go of the vines, lands safely on the ground, and starts running in order to escape the Griever and lure it further away from Alby. Keeping track of the turns he makes so he can find his way back, he rounds one corner and sees three Grievers rolling towards him. Like the trials of adolescence, the Maze is testing Thomas’ ability to remain calm, mature, and hopeful despite the pressures and setbacks. Plaue, Ethan. "The Maze Runner Chapter 20." LitCharts. LitCharts LLC, 22 Jul 2015. Web. 18 Apr 2019. Plaue, Ethan. "The Maze Runner Chapter 20." LitCharts LLC, July 22, 2015. 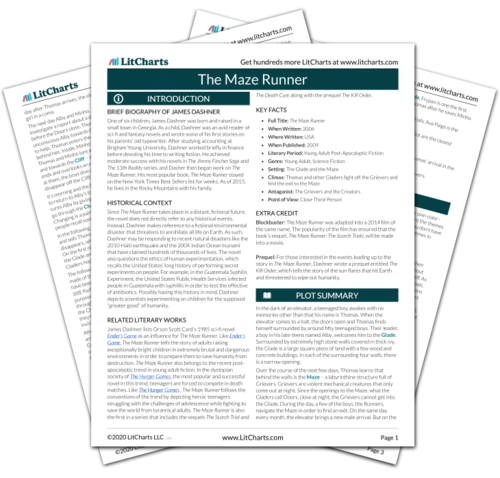 Retrieved April 18, 2019. https://www.litcharts.com/lit/the-maze-runner/chapter-20.